After a very pleasant day cycled around the area of Santiago de la Ribera and an even more pleasurable evening with Auntie Francis and Stan where again we were treated to wonderful home cooked food and beautiful wines so drama unfolded as we made for home some 5k’s away. Rather than cycle back again to NiKi in the dark and it being slightly later than the previous night the decision was made to drive Stan’s car back and then we would head back over with it the next day enabling David to take his golf clubs in the car for Tuesday’s game. So off we set at close to midnight fortunately with the key to the main site gates on the van key fob as the restaurant was also shut on this evening and that is our usual way in when the gates have been secured on site. Parking the car by the gate we got out and headed towards the small entrance gate with David fishing around in his pockets for the keys. No not there, must be in the car then and so after a quick search –nothing. Have I got them, did I take them when we locked the van. Again a quick search on my person- nothing. Damm they must be with the bikes somewhere, or back at the house on the table. Another search was made to confirm that No the keys weren’t with us before we make the call to say we are returning. Back at the house a search had also kindly been made by Francis and Stan on the table inside and out, nothing there. We search further and harder when we get back, all around the bikes the garden anywhere that we might have walked in the garden and house, but NOTHING. The keys to the van were gone along with the newly obtained site security key. Everyone tried to stay calm and of course the offer to stay was made and to resume the search tomorrow. But as we all know when things go missing, all the ifs, where’s and but’s fly around in your head. Our main thought was that perhaps after locking the van we had dropped them on the floor by NiKi or had even just put them on the outside chairs while we got the bikes ready. So back we had to go hopeful that this was what had happened. Keeping our eyes open as best we could on the cycle path as we drove back for the 2nd time with everything crossed that possibly could be crossed. 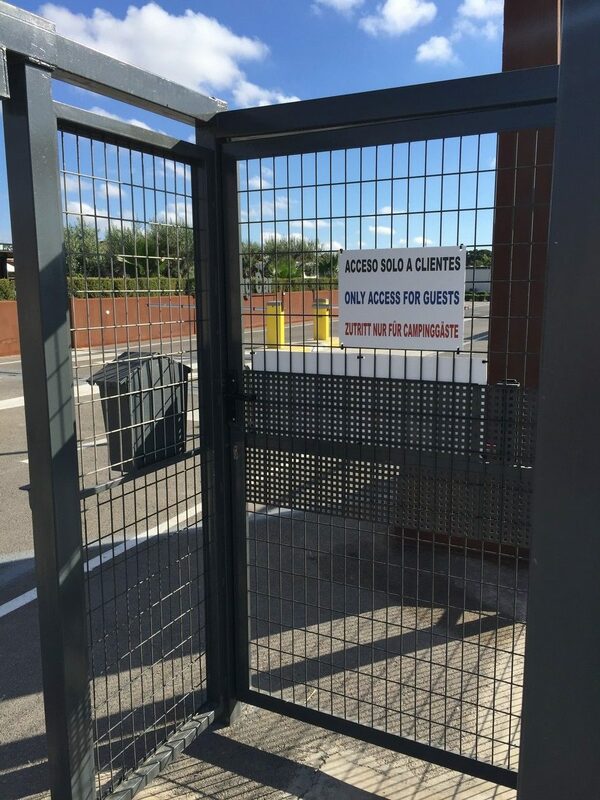 The next question was how to get into the site which is secured all around and has big metals gates right across the entrance and are there alarms or indeed cameras. Even if there were we had to get over the gate and to the van to at least eliminate that possibility and hopefully find them. With me, being the lighter and more agile David gave me a helping hand and remembering my tree climbing skills of old I dropped down into the perimeter, fortunately with no alarms going off. Back outside NiKi I searched the floor, chairs, bushes anywhere they might be and then started eyeing the van wondering about possible ways of getting into her. On the way over we also remembered that David had put some rubbish in the site bins outside and so he was making a search of them- thankfully not too full of food rubbish etc, but again nothing. So with nothing left to do or search we knew we would have to spend the night at Francis and Stan’s and then resume the search of the cycle route tomorrow and hope for the very best that either they would be along the route somewhere or that if found someone would have handed them to the police, nothing being marked on them as to what or where the vehicle is. 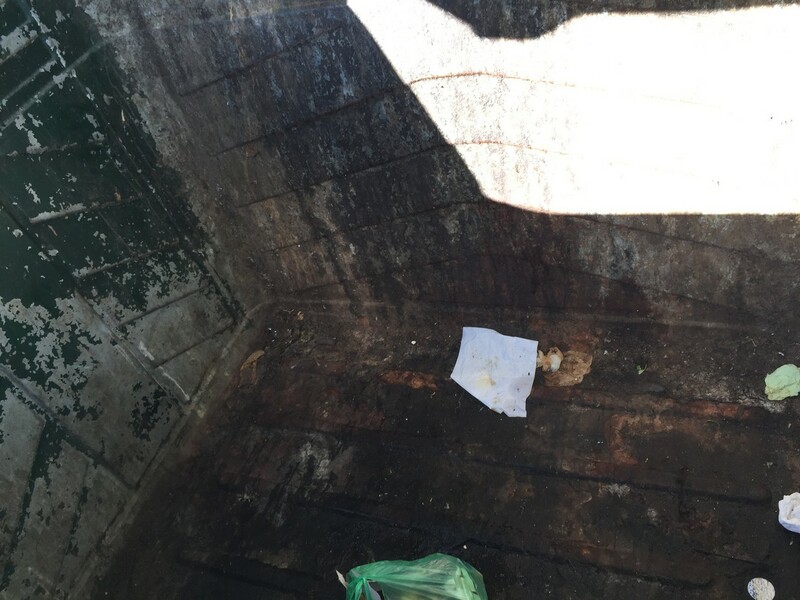 The empty bin the next morning. With me still on the inside waiting to clamber back over and David still with his head in the bin, a cry went up from him. 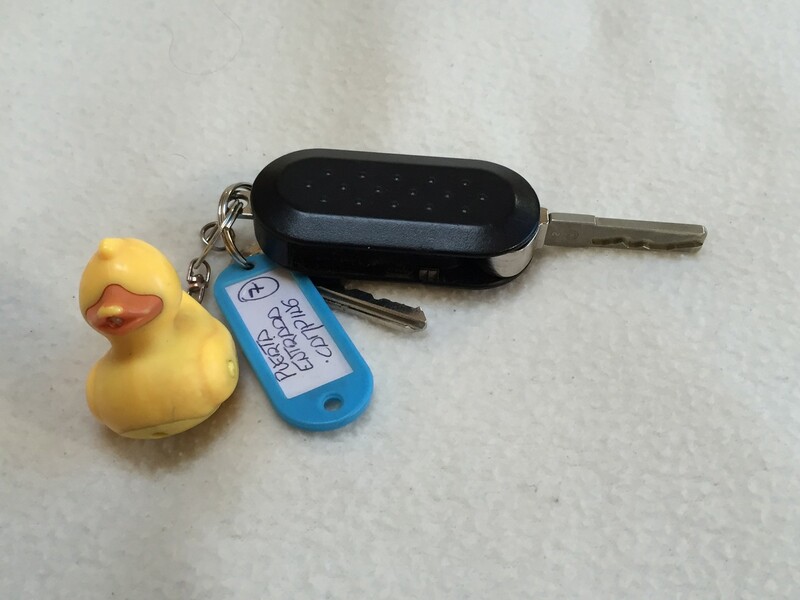 He thought he could see something bright yellow tucked under a bin bag, could it be Duck keys. Out of desperation, David hauled himself into the bin, and burrowed into the rubbish bags to grab at our last hope for the evening. But, Yes you’ve guessed it by now as otherwise we wouldn’t be writing this tale Lady Luck smiled upon us and there were the Duck keys buried under the rubbish . The relief was palpable as we entered the site using the key and opened up NiKi. Apologetic phone calls were made back to Francis and Stan whilst having a quick drop of whiskey to calm our nerves before hitting the sack. As we sat laughing and joking ( if you believe that you’ll believe anything!!) 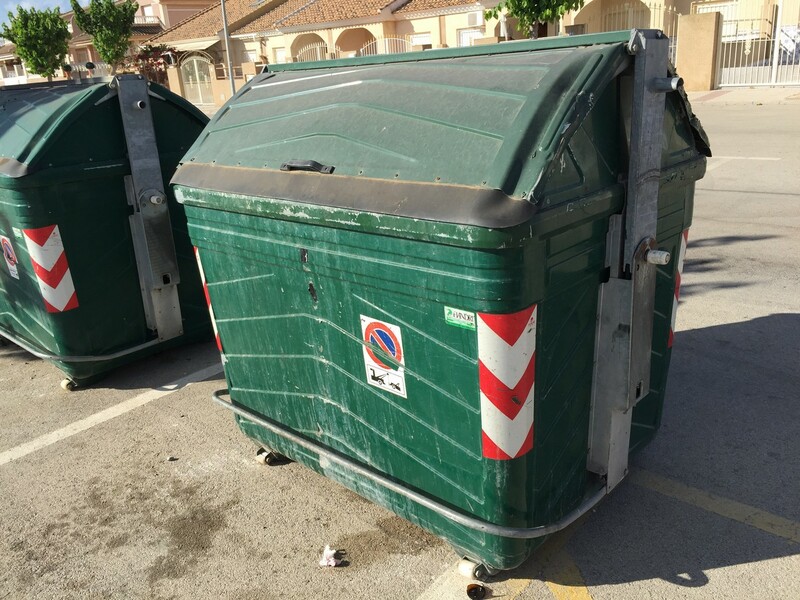 about our silliness so we heard in the still of the night the rumbling of the dust cart emptying the bins…………..
Well I had a great laugh at this post but you seam to be ha wing a great time. So which one of you binned them then, or is that just reopening old wounds? That would have been me! Old wounds opened. But what the hell. Please forward a picture of David with his top half in the bin…. We have plans for it.